This Maheswari Cotton Silk Saree has elegant Black body with Light Green, Sandalwood and Pink color stripes on the upper border and Zari Gold and radiant Pink colored strips on the lower one. 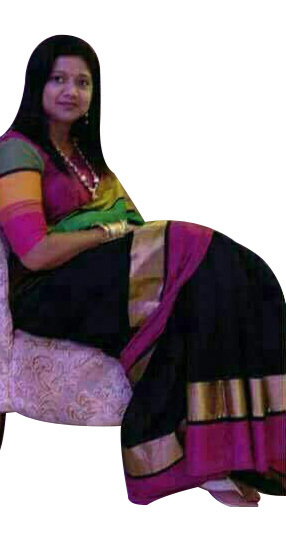 Elegant Black body color of the Saree contrasts perfectly with the multi colored border. Natural weaving pattern adds radiance to the saree body colour. There is Bright Light Green, Sandalwood and Pink colored strips on the upper border and the Zari worked Golden colored and radiant Pink strips form the lower one. 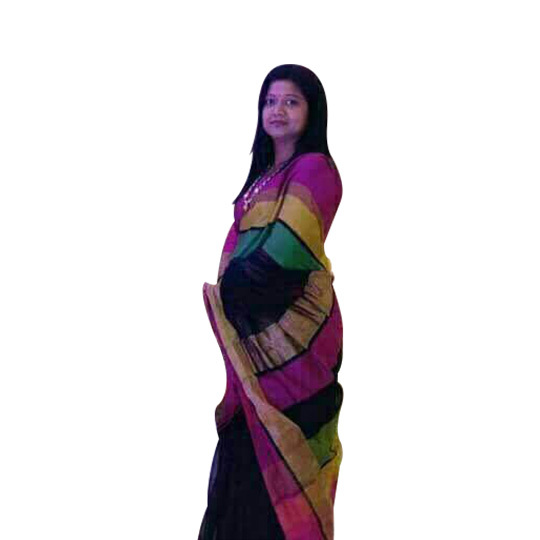 Classic Black colored body of the saree has perfectly contrasting broad Zari Golden, Pink, Black, Light Green, Sandalwood and Pink colored broad strips across the pallu. The natural Cotton and Silk fabric and pure vegetable colors add a unique luster to this traditional saree. This elegant black colored saree has beautiful multicolored border with matching multicolored pallu. Ideal for casual and semi formal occasions in your life.